Thane Society for Prevention of Cruelty to Animals (Thane SPCA) is among the very few professionally run NGOs in Mumbai working in the animal welfare space. The NGO provides holistic care and rehabilitation to animals in need. The team rescues stray animals and help them avail their right to their natural habitat. The NGO’s strength is its in-depth knowledge of the Animal Welfare Laws which help them save several wild lives by sending them back to their natural habitat or a wild life sanctuary. With no support from the State Government during inception stage, committed members of Thane SPCA started operations with private funding in 2002. Today, the NGO has a hospital exclusively for animal care with all basic facilities with dedicated staff. The hospital provides free treatment to all stray animals. Animals treated include: dogs, cats, rabbits, pheasants, donkeys, cattle, wild animals, snakes etc. and many others. They have also launched two mobile ambulances that rescue injured or homeless animals in and around the district of Thane. However, these facilitates are not sufficient to treat the increasing number of ailing animals. In FY13, Thane SPCA treated 6,984 animals as against 4,942 in FY12 (Y-o-Y increase: 2,042 animals). The organization is recognized by the Animal Welfare Board of India. It is also a Member of London-based World Society for the Protection of Animals. 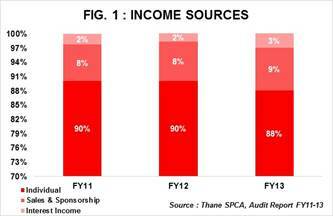 Total Income: Thane SPCA recorded a 16% Y-o-Y increase in total income in FY13 with an income of Rs4.3mn over Rs3.7mn in FY12 (Refer Fig. 1). Individual donations were the major revenue contributor (88%). Other revenue contributors were income generated by offering veterinary treatments (9%) and interest income (3%). Programme V/s Other Expenses: 62% of total expense was incurred to meet the NGO’s direct programme expenses in FY13. Staff expense (39% of total expenses) is also included in direct programme expenses. Overheads for the period FY11-FY13 have been around 16%-17%. High overheads in this case are justified as the cost to run a hospital is relatively high when compared to NGOs focused on activities other than hospitals. Admin Expenses in Fig 2 include professional fees, fund raising cost and other sundry expenses. 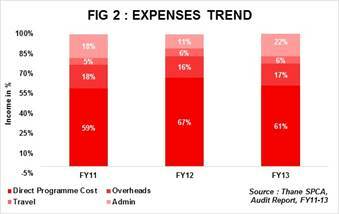 The jump in admin expenses from 11% in FY12 to 22% in FY13 was primarily due to a hike in professional fees paid in FY13. During FY13, the NGO had appointed an external agency to prepare an assessment report on Thane SPCA. It is because of this that professional fees increased from less than 1% in FY11 to 5% in FY13. General Reserves and Earmarked Funds: The NGO has maintained no trust corpus. General Funds at the end of FY13 was Rs3.6mn (Y-o-Y increase of 28%). Earmarked Funds for same period was Rs0.9mn, up by 38% from the previous year. 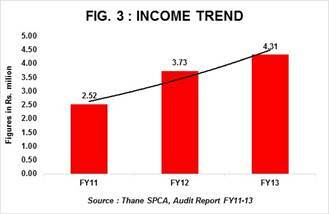 Income Growth Rate: Thane SPCA posted a 3-Year income CAGR of 31% for the period FY11-FY13. The Y-o-Y increase in income can be attributed to (i) continuous support from existing donors/sponsors and (ii) funds raised by hosting fund raising events. The number of donors is gradually rising for Thane SPCA; thus boosting their confidence in executing their programmes. With an increasing donor base and better visibility, the organization is likely to benefit in the years to come. High Self Sufficiency Ratio: The organization’s self-sufficiency ratio deteriorated marginally by 7% i.e. reducing from 146% in FY12 to 136% in FY13. The decline is owing to an increase in expenses during FY13. It was the abnormal increase of 22x in professional fees paid (Rs201,500mn) in FY13 which dragged down the ratio. Self-sufficiency ratio indicates ability of an organization to meet its expenses from its own funds. Lack of Infrastructure: With increasing awareness of animal care; people across the district approach Thane SPCA for providing care and support to stray animals. Due to lack of space and limited infrastructure facilities, the organization is unable to extend their support to a higher number of ailing animals. There is a demand from people to increase the number of mobile vans; however because of limited funds, this has been put on hold. Support from Volunteers: The organization requires more volunteers to support them in their fund raising and awareness programmes. With limited human resources, the NGO is unable to establish new contacts in a concentrated manner. Retaining existing volunteers has remained a challenge for the organization. Bureaucratic Administration: Freeing wild animals from individuals who own them for commercial benefit requires involvement of district/state owned bodies, political parties and other activist groups. At times, such matters are even dragged to courts. The bureaucratic approach by government officials and prolonged decision making eats up a lot of time of the management. Despite the prolonged decision making process and paper work involved, Thane SPCA ensures they chase aggressively to resolve the case as soon as possible. To cite an example, it took Thane SPCA over 2 years to rescue a female elephant from her owners and transporting her to a natural habitat. The Governing Council of Thane SPCA is composed of seven committed animal welfare activists. The Governing Body meets atleast once every month to review operations of the NGO. Mrs. Shakuntala Majumdar (President), the Founding member of Thane SPCA, is among the most influential people in the Country’s Animal Welfare environment with 20+ years of rich experience in this space. Her only passion in life is to alleviate suffering of animals. She is an Honorary Animal Welfare officer appointed by the Government of India and by the Committee to Monitor Animal Welfare laws in India by the Bombay High Court. She is the Convenor of the State Animal Welfare Board, appointed by the Bombay High Court to monitor trafficking of wild birds and animals. The administration, supervision of hospital premises, expansion plans and public relations are the thrust areas of Vice-President Mr. Debashish Majumdar. Mr. Majumdar is a Printing Technologist by profession and holds a senior position in a corporate entity. Mr. & Mrs. Majumdar are the key decision makers at Thane SPCA. The NGO is registered with GuideStar India & Samarthan International. Applications with Credibility Alliance and Charities Aid Foundation have already been submitted. They expect to get registered by end of FY14.